Hey everyone, my status just changed to 'in transit'. I'm just wondering when I can book the interview at the London embassy? Do I have to have received anything in the post beforehand? You have to get your police certificates and medical before you can attend the interview. And four photos, shot record, health summary from GP, and a written report from GP if you've had major illness, surgeries, or depression issues. NHS isn't always fast or cooperative, so get those arranged before committing to a medical appointment date. Sorry I should have been more clear! I have all of those documents. I’m wondering when I am able to book the interview, is it enough that my status has changed to ‘in transit’ on ceac? Or do I need to have received some sort of letter from the embassy to confirm they have received my application? Do you have LND number? Do you have a medical appointment booked? Do you have your I-134 from fiancé in hand? Pick an interview date at least two weeks after medical. They aren't getting results to the embassy in 5 days like they say. If it's too soon, the system won't let you in to book the interview. If you get in, then carry on. You don't need the letter of instruction in the post as long as you have carefully read London's instructions. In addition to what everyone else above has said you can book the interview online when your status changes to “Ready” and the DS-160 is completed (you need this number for booking the interview). You don’t need to wait on any letter. The letter you receive just points you to the website of official instructions. You’ll receive that in about a week. Thank you for your reply, this was what I was after! 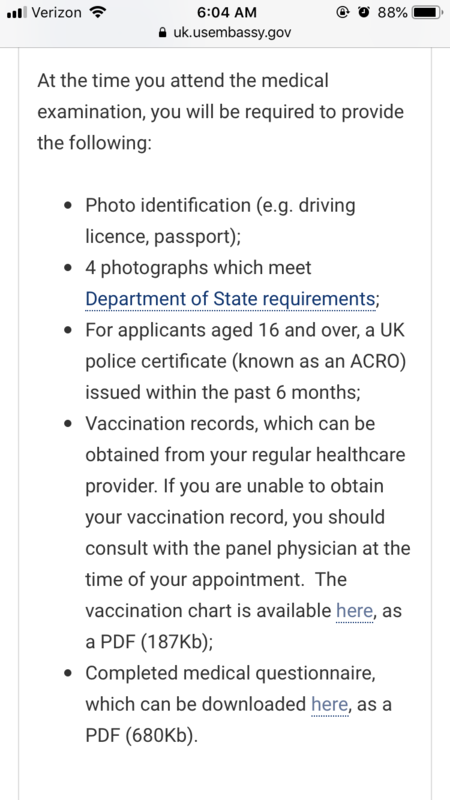 Piggy-backing off of this - I know we are able to BOOK the medical once we have a case number - but can we attend it before having an email or P3? Asking because my fiance is concerned about point F in his confirmation email for his medical: clearly asking for a written form of the case number. But it seems many are encouraging setting an appointment before this is received? Yes, you have to have something on paper with your LND number to show at the medical. Many are in a rush and don't want to follow London's outlined steps. Sometimes that adds hiccups unless you understand the process completely and plan accordingly like having all the things needed for the medical before attending. Rather than start a new thread I thought I'd ask here as it's sort of relevant. Is it advisable to book my medical now? We received our case number from the NVC today by phone and our CEAC status is 'at NVC' we're hoping to be on the April 2nd shipment. I have my police report, medical summary and immunisation record in hand and I will have affidavit of support in two days. Thing is, I live in Belfast so I know I'm going to have to make two separate trips to London and I'd like to get my medical date nailed down so I can book my first flight. Is it too soon or do you think I'm in an acceptable position to book? Thanks for any input you can give, I'd really appreciate it. Sure, book it because you are prepared with everything you will need to take to the exam. It's the ones who don't plan ahead who get in trouble. They blindly book for next week then get in a panic when they figure out they need things from their GP and the GP won't be able to assist them for three weeks. Hi - I was just curious if the Health summary from the GP is absolutely necessary. 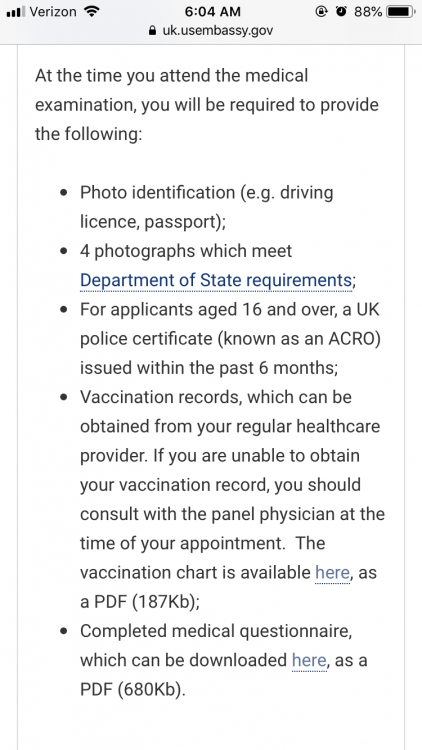 Going off the required documents from the uk embassy website attached, it only specifically mentions the vaccination summary. I’ve just read horror stories of difficulties trying to get these health summaries so I wanted to be sure if it was necessary for medical or interview.